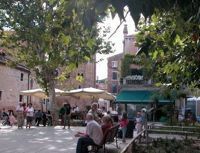 We have long loved the picturesque, sprawling, leafy Campo San Giacomo dell’Orio. The church makes lovely curves from the outside (though sadly in comparison with most Venetian churches, it’s devoid of masterpieces within) and it’s off the main drag so tends to be peopled by local families and their bewildering array of dogs that, almost without exception, defy Kennel Club definitions. We were toying with the idea of giving a second chance to Il Refolo, which disappointed when first opened, or snaffling a rare table at Il Prosecco, the superb bar with copious cichetti that can happily constitute a light meal. But then we spotted a table in the sun at Capitan Uncino, which we’d never (for some reason) considered trying before, and that was that. I didn’t realise until later that the name translates as Captain Hook – probably just as well as I’m not a Peter Pan fan. There’s a surprisingly capacious interior room seating about 50 but even Venetians were tempted to risk an April chill outside the day we were there, with the opportunity to watch the world go by. The menu is extensive, with a big range of interesting-sounding pizze from €7. But it’s definitely more than a pizza joint. We kicked off by sharing a big plate of antipasta all’Italiana (€10) – mixed meats with some good prosciutto, salami etc and wonderful wafer thin slices of roast pork. That was followed by the pasta speciality of the house, pappardelle con scampi, zucchini e radicchio di Treviso, which was excellent, and tagliatelle con fiore di zucca e gamberetti. Actually the latter turned out to be pappardelle too (but I wasn’t complaining) and both dishes were well cooked, well balanced and well worth the €15. We’d also spotted that there were some interesting side dishes on the menu and had ordered radicchio alla griglia (€6) to follow. It came with the pasta, which was slightly odd, but was good. Normally that would have finished us off at lunchtime, but unfortunately I had seen the desert trolley being displayed to the next table – somewhat of a rarity in Italy where it’s all too common for puddings to be commercial and straight out of the freezer. These were manifestly made on the premises, and a lovely array they were: there are actually two trolleys and I had to request the one with all the gooey, chocolatey things on it rather than the slightly more grown-up one. I chose a chocolate torte with pears (€6), which wasn’t actually as good as it looked but certainly provided the requisite sugar rush and deep feelings of remorse. This was compounded when I had the happy thought that they might serves groppini (a cross between a pudding and a liqueur – lemon sorbet with vodka and prosecco) and they did… always a good sign in a restaurant in Venice in my view as not all establishments are prepared to make them for you. They were good, too, at €10 for the minimum order of two. The waiters had realised by this stage we weren’t there just for fast food and were both pleasant and efficient. We stuck with very palatable house wine that came in rustic ceramic pitchers at a very modest €9.50 per litre; the white was a good tokai blend. We whiled away a very pleasant couple of hours with no trouble at this good and unassuming restaurant and would recommend it – but I promise we will re-visit Il Refolo soon.